Bobbi Brown does it again. 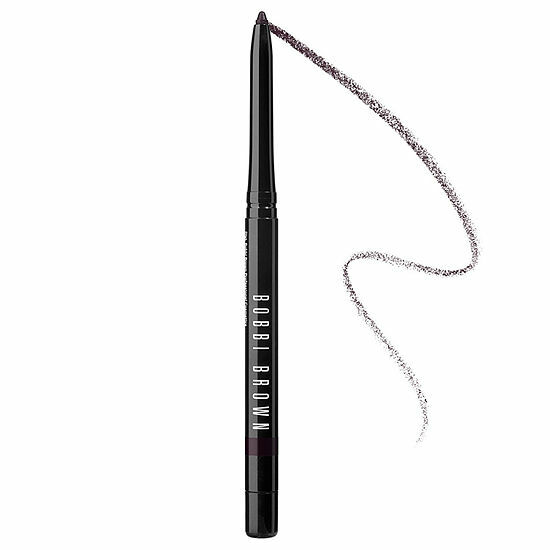 There are 397, 845 (made that number up) eyeliners on the market. And a lot of them are crap. Yeah, I said it. I’m frequently disappointed when I try a new eyeliner. I often find liners to be too smudgy, not pigmented, or, if they’re a pencil or crayon, too uncomfortable to use. What, you’ve never felt the cruel pull of a too-hard pencil or crayon liner on the delicate eye skin? Then consider yourself lucky. When I found the Bobbi Brown Perfectly Defined Gel Eyeliners though, I was impressed. I keep Scotch, a brown with bronze gold shimmer and Chocolate Truffle, a dark brown, in my pro kit. I buy several at a time because there’s not a wedding that goes by when I don’t use at least one of them. The Perfectly Defined Gel Eyeliners are not gel liners in the traditional sense. They’re more what I consider to be crayon liners, but I guess Bobbi Brown considers them to be a sort of solidified gel liner. Semantics, you know? I use these liners primarily at the bottom lashline because not only do they give soft definition, but they stay in place. Bottom lashline liners are generally more prone to smudging because when the eyes tear up or water, that thing called gravity pushes tears over the ridge of the bottom lashline, passing over any makeup there. But the Perfectly Defined Gel Eyeliners are waterproof, so once they are on and have set, they are there for the long run. I say “once they have set” because you do have about 30 seconds after applying the liner to soften or smudge it with a brush. I like to do this with a small pencil brush, as I’ve found that gives me the control I need to soften the liner without removing it or dragging it down and thickening the line. Especially at the bottom lashline, I think it generally tends to be more flattering to have a soft focus effect than a harsh line. You can use the Perfectly Defined Gel Eyeliners on the top lid too. For my client purposes, I usually prefer a gel liner at the top lashline, as it’s more intense and helps give a more flattering shape to the eye in photos. But you could certainly use these liners at the top lashline. They are $27, which I know seems pricey if you’re used to $9 drugstore liners, but if you’ve been struggling to find a long-lasting, comfortable, pigmented liner, maybe it’s time to try a Perfectly Defined Gel Eyeliner. They’ve got six colors to choose from, and you can find them at Bobbi Brown counters and online, as well as at Sephora and Sephora.com.